The Street With No Name is the gateway to our community for many residents and visitors alike, but lately it’s been looking a little unloved. 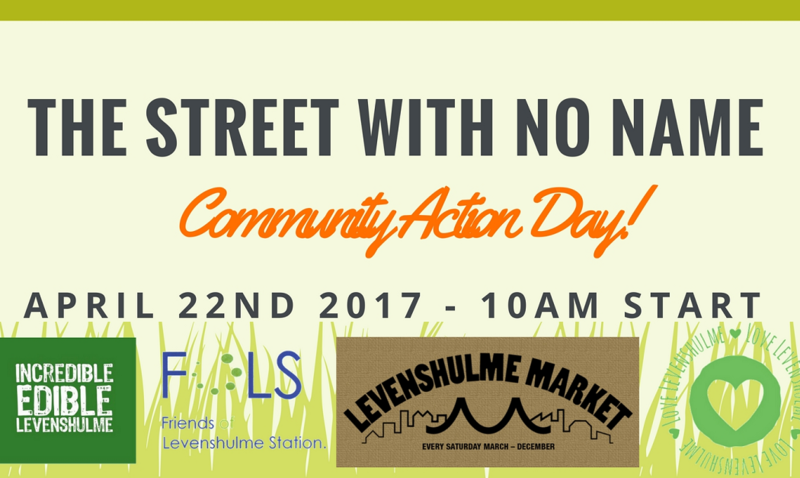 We’ve got together with the Friends of Levenshulme Station, Incredible Edible Levenshulme and Love Levenshulme to organise a community day of action on Saturday 22nd April from 10am to 2pm. We’ll be clearing litter, preparing some new spaces for planting and generating ideas for what we can do with this iconic space and we really want you to join us! There’s a Facebook event you can join here where you can share your ideas on what you’d like to see done – all ideas welcome. Meet us on the street any time from 10am – you can join in whenever suits you and all the equipment you need will be provided, including a free hot drink at the end – all you’ll need is some energy and imagination!